Summary: An absolute steal at this price! Review: You've got to be kidding that this book sells for as little as it does. No doubt the diminutive size of each reproduction figures into the low price, but the quality is first rate throughout. 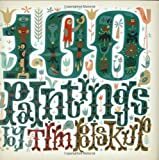 Tim's imaginative renderings (at actual size in the reproduction) are bright and crisp and colorful and energetic and...and..and.... If your house, like mine, is filled with coffee table art books, this bite size morsel is just perfect to fill in the little crack left in a wall of books. Not only do you get spectacular images, Tim has included information in the back about when and where each picture was shown. Each image is placed on a black matte background which launches the image toward you. The binding in the book is first rate and will last well into the future when it becomes that hard to find collectors' item in 3004. And if you're reading this review you know you don't even have to get up and go out the door to get it, so get it!